The Hammarhead Industries Solo X motorcycle is a unique bike from all angles. It's base, a Ural Solo sT, is robust with its protruding cylinders. I found that photographing the bike from above was the best way to capture its uniqueness. The image gave the bike an extension of its character, appearing to have similarities of an arthropod. The graphic was intended to be used in the line of t-shirts, as well as printed to large posters. Side by side comparison of the original sky view shot and the full illustration. 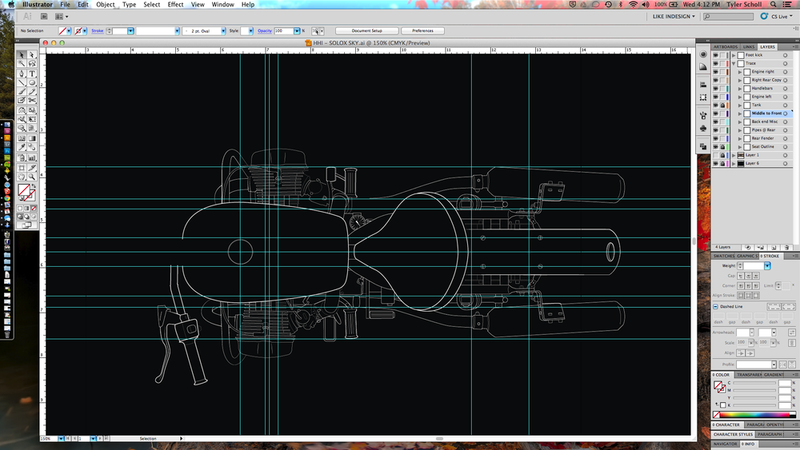 Some aspects of the bike were freehanded due to lack of perfect top view alignment of the original photograph. Many guides were used to aid in a symmetrical and true to form illustration.